Spring is finally here! There is a new energy, a vitality in the air. I can hear songbirds all hours of the day and dreary, brown bushes all around are coming alive with new leaves. Until you come up close, fresh leaves seem like tiny buds, waiting to unfold and reveal themselves to the world. Nature is brimming with wonder! What does that have to do with Tilapia and that too blackened, you may ask. Well, just as spring weather and beauty cheers up the mind and soul, this easy to cook fish cheers up the palette. The contrast of the spicy Cajun mix on the fish with the cool feel of cucumber and zest of lime in couscous salad, makes the taste buds sit up and take notice. So, without further rambling, here’s a meal that can be put together in under an hour, with just a little bit of forethought to buy the tilapia! Tilapia fillets are very delicate. I try to buy fillets from the butcher counter that are already defrosted. If you can’t find those at the grocery store, pick up frozen tilapia. 6 ounce filets, which are approximately 170 grams, are the perfect helping for one person. Check the filets, if they don’t seem clean, gently wash them. Don’t be too eager to scrub and clean or you might end up with tattered fish. Pat it dry and then season the filets. For seasoning sprinkle salt, ground black pepper and a generous helping of Cajun seasoning. Rub this into the fish, turn over and repeat. et the filets sit for a few minutes. Next, crush and slice some garlic. In the meanwhile, heat up a frying pan preferably non stick or cast iron. Add 1 to 2 tablespoons of olive oil to the pan. Spread it around and coat the pan. Saute garlic until it’s golden. Lay down the filets gently into the pan. If they sizzle on touch, the temperature is just right. Cook for 4-5 minutes per side. Perfectly cooked fish changes colour (as all meats do) to a white and becomes flaky. At this stage, turn off the heat. If you have a convection stove, remove the frying pan from the stove top. Blackened tilapia is ready to serve! I like to have it with something light and flavourful like couscous salad. Read on for the recipe. Blackening it is a real thing. Couscous is one of the easiest side dishes to cook. All it takes is boiling water, salt, a dash of olive oil and a serving bowl. For two people measure 1/2 a cup. Unlike rice and quinoa, washing couscous is not common. 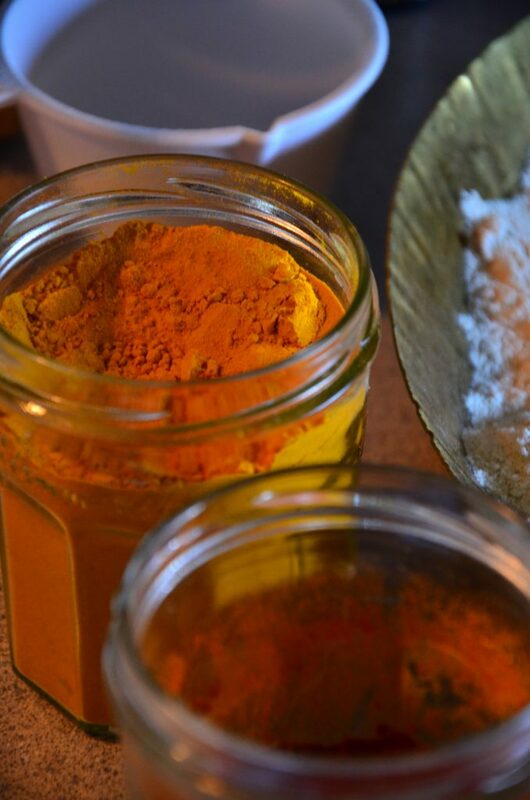 Instead spread it in a plate and remove anything that seems like a stone or debris. In a saucepan, boil 3/4 cup water. You could add about 1 cup, because if you do not use a lid, there will be some loss in volume. While the water is boiling, finely chop cucumber, tomato and herbs. Make sure the vegetables and herbs are washed in plenty of water. Transfer couscous to the serving bowl you plan to use. Pour boiling water over it, add a teaspoon of olive oil and some salt. Cover with a lid and let it sit for 5 minutes or so. Open and fluff with a fork. Let the couscous cool down before mixing in the chopped ingredients. Top it off with a squeeze of lime juice. Plate couscous salad and lay a tilapia filet over it. A fresh, zesty and flavourful meal is ready! I often serve dinner with a side of sautéed asparagus and grilled potatoes. This is a meal bursting with flavour! Try it! Follow Us on Instagram, Facebook and Twitter for lots more deliciousness! Spring is a time for fresh growth, exploration and for bright flavours in our food. 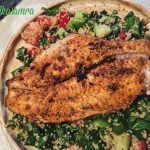 A meal full of flavours, this Blackened tilapia is a snap to cook with a versatile couscous salad that pairs with everything! Try it. Check the filets, if they don’t seem clean, gently wash them. Don’t be too eager to scrub and clean or you might end up with tattered fish; pat it dry and then season the filets with salt, ground black pepper and a generous helping of Cajun seasoning. Let the filets sit for a few minutes. Heat up a frying pan preferably non stick or cast iron. Add 1 to 2 tablespoons of olive oil to the pan, saute garlic until it’s golden. Lay down the filets gently into the pan, cook for 4-5 minutes per side. At this stage, turn off the heat and remove the frying pan from the stove top. Blackened tilapia is ready to serve! For two people measure 1/2 a cup of couscous. Bring 3/4 cup water to a boil in a saucepan. While the water is boiling, clean and finely chop cucumber, tomato and herbs. Transfer couscous to the serving bowl you plan to use and pour boiling water over it, add a teaspoon of olive oil and some salt. Cover with a lid and let it sit for 5 minutes or so. Cool the couscous before mixing in the chopped ingredients. Top it off with a squeeze of lime juice. Plate couscous salad and lay a tilapia filet over it.